Hello readers and Happy New Year! Firstly I would like to apologise for my lack of blogging over the holidays. 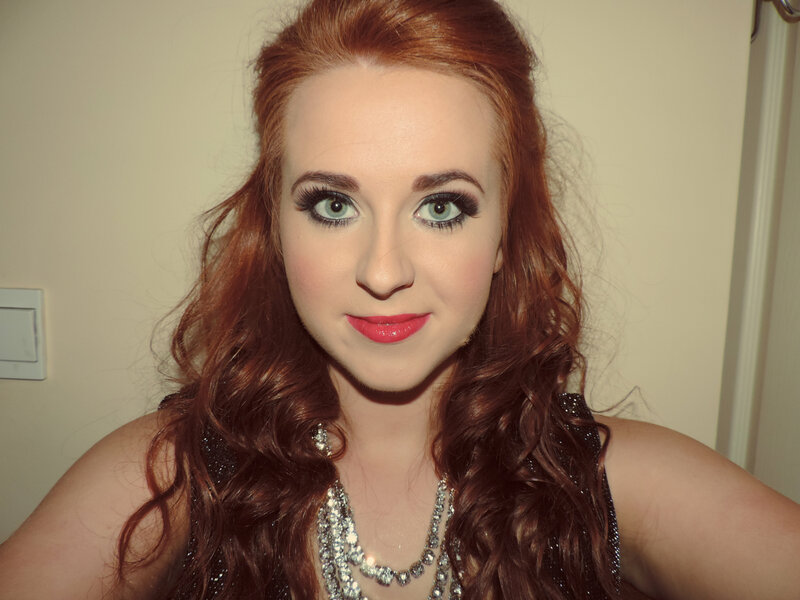 Today I am going to show you some of the looks I created for nights out over the Christmas using my MAC palette. The first Look is from a night out on St. Stephens night. 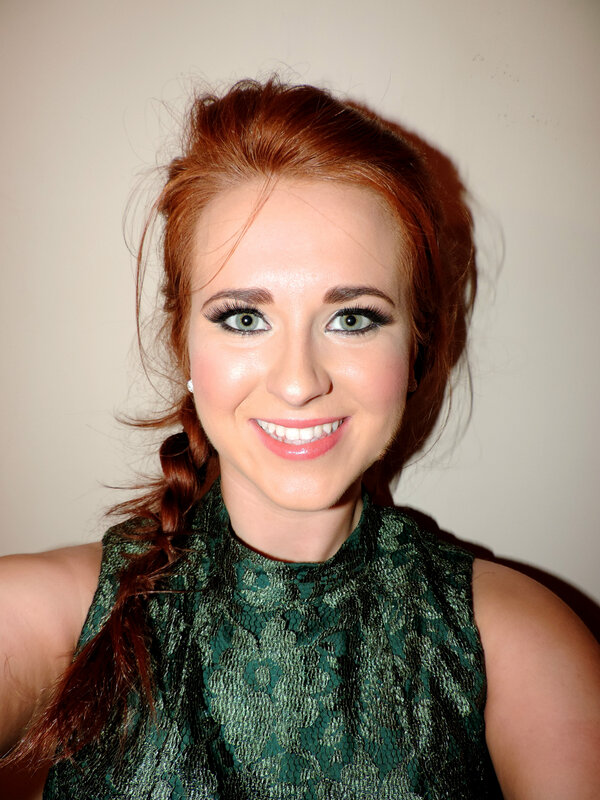 As the dress I wore was a bright festive green colour I wanted to keep my eye makeup neutral, nothing too smokey. Of course any night time look would not be complete without false lashes. I normally wear Eylure lashes but I got a pair of MAC no.12 lashes for Christmas so I said I would try them out for a change. They are now currently my fave pair and I am off to buy more next week. They retail at €12 and you can get them at MAC in Brown Thomas. I always try to reuse my lashes as they can be expensive if you wear them as much as I do. To keep my lashes in good condition I take them off as soon as I get home and place them on my dresser or somewhere safe. In the morning I clean my lashes with my cleanser. Pick the glue off first and gently rub the lashes with some cleanser to get off any mascara. I try to apply my mascara before the lashes because I find you can wear them more then. After all that I put them back in their container for the next time. 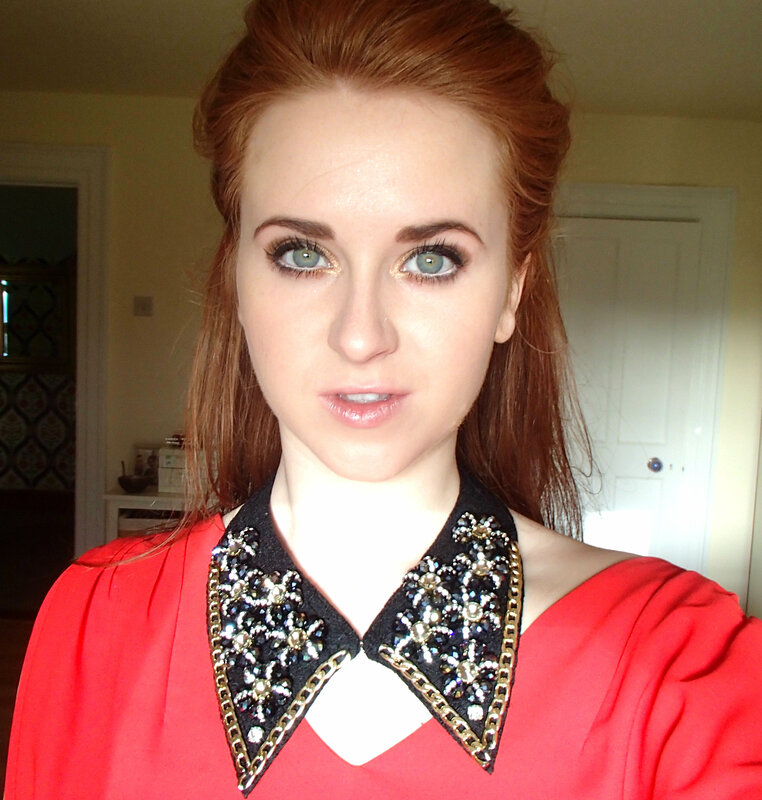 For the first two looks I used the same foundation which is Estée Lauder double wear in shade ‘tawny’. I love this foundation for a night out as it is long lasting and stays in place, I rarely have to top up my foundation. However I find it too heavy for during the day as I like a light coverage foundation and this is a medium to heavy coverage. Double wear retails at €35. I used Brow zings light for my eyebrows and They’re Real mascara by Benefit. Now back to what eye shadows I used for this look. The base is ‘brulé’ which is a cream matte eye shadow. I then applied my gel eye liner which is Bobbi Brown ‘black ink’ which comes in a pot. Recently I have been applying my liner before I shade in because I find it makes the shadow look neater and there is less tidying up to do after. I applied ‘wedge’, a brown matte shadow to the crease of my eye and blended. I didn’t want to go too dark with my eye shadow because my lashes were making the statement. For underneath the lash line I used a MAC pencil ‘orpheus’ which I got last year and love it. It is a bronze/black shade with flicks of glitter in it. I use this under the lash line to frame the eyes and then used MAC’s ‘smolder’ black Kohl pencil for the waterline. Now my New Years Eve look. For my NYE look I used the same shadows as the previous look but wanted to make my eyes stand out more so I added ‘sketch’ which is a dark purple slightly shimmery shadow which comes out brown rather than purple. It is great to add over ‘wedge’ to make your eyes darker and stand out. I used the same MAC no.12 lashes but used ‘scene’, a grey/blue matte shadow for under my eyes. 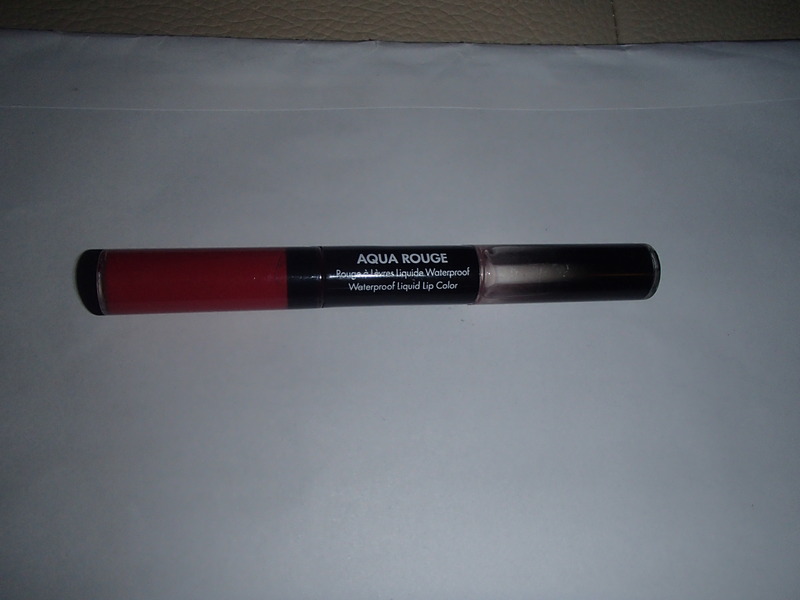 I wore a strong pink lip gloss with this look by Make Up For Ever ‘Aqua Rouge’ no. 19 in ‘Pomegranate Pink’. It is a waterproof lip gloss that actually works!!! I hate wearing lip stick that wears off quickly when eating and drinking so I bought this during the summer and can’t get enough of the product. It is double ended. One side has the colour which is long lasting and you apply first and then on the second side you have the gloss that creates the shine. My NYE outfit was very glitzy so I wanted to keep my face simple. Sometimes less makeup can make more of a statement if you just enhance the features you have. My final look is my Christmas Day look which is different to the other two above. 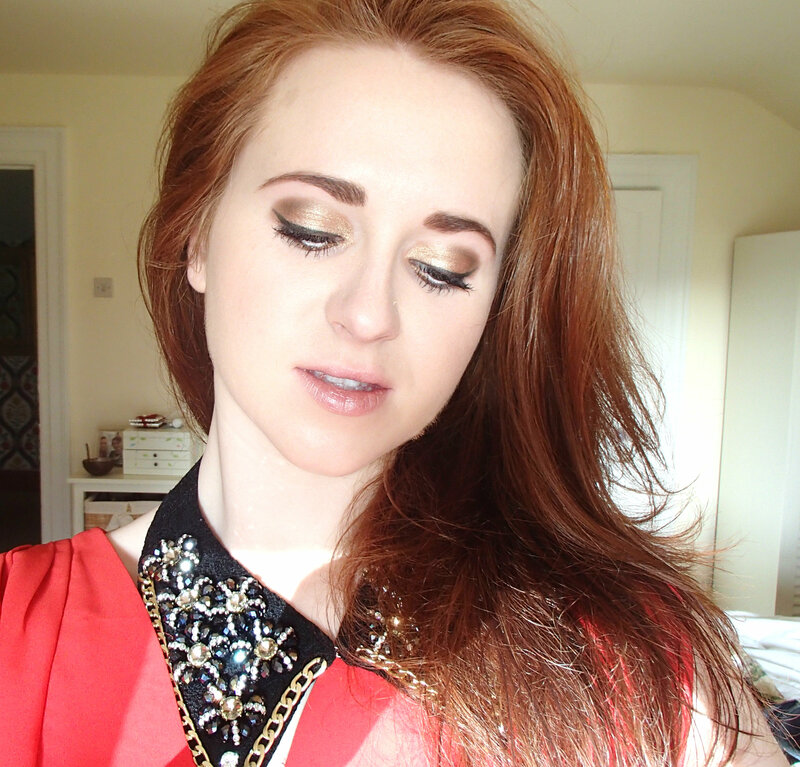 I love using gold eye shadow with glitter so I went all out for the festive season. This look can be both a day time or night time look. I have no false lashes on either just my They’re Real mascara. 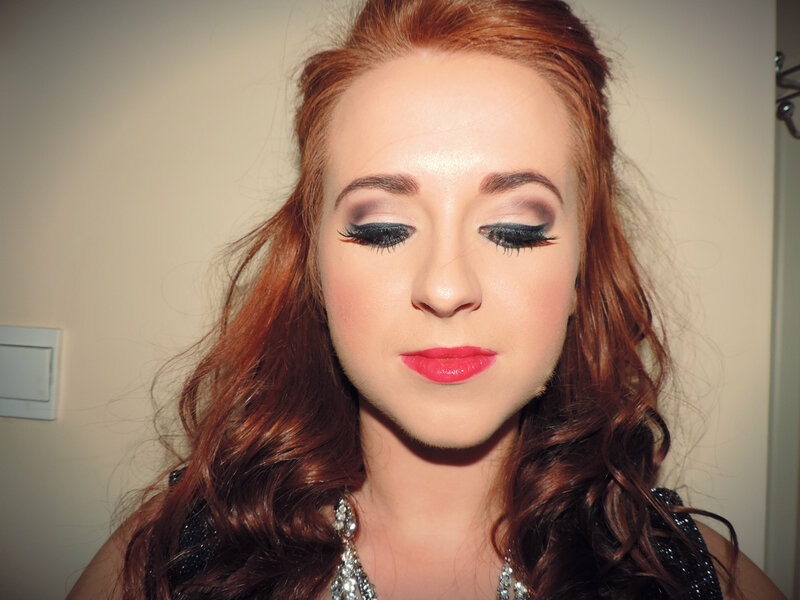 Eye shadow is all about preference and what you feel most comfortable wearing. I love experimenting with different shadows and sometimes it works out and others it doesn’t so I always have cleanser at the ready in case I go that step too far. For this look I used a MAC lip gloss called ‘love nectar’ and I used Armani Lasting Silk foundation 4.5. Now onto my eyes. For the base I used ‘wood-winked’, a bronze gold shimmer. This shadow is very similar to Urban Decays ‘half baked’ shadow. For the crease of my eye I used a dark brown matte shadow ‘espresso’ and blended. 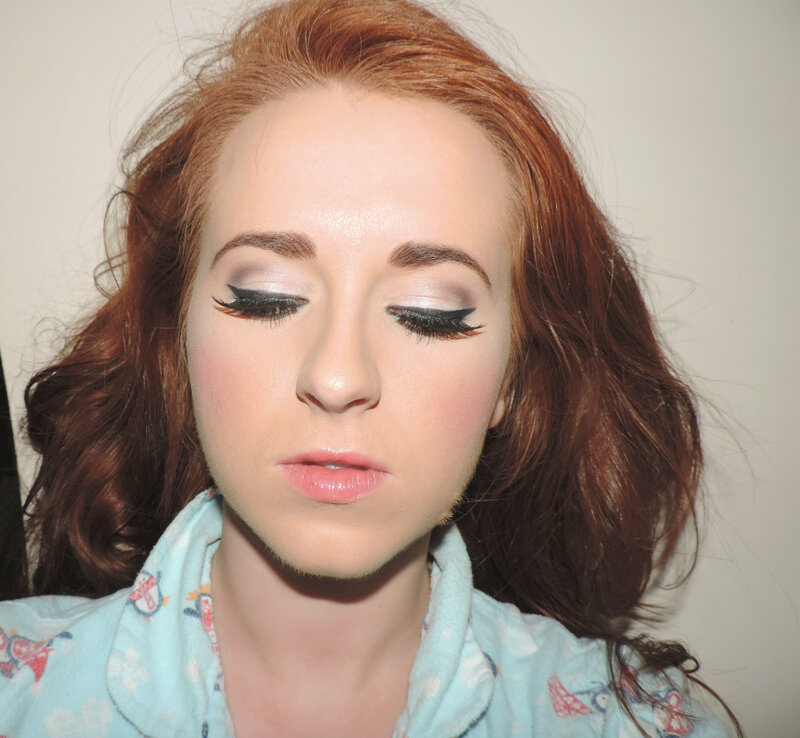 I also used ‘espresso’ for under my eyes and then used a Mac shimmer pot ‘melon’ on the inner part of my eye lid. The MAC palette I have is made up of my favourite shadows and each refill shadow costs €11.50. The pot normally costs €15 for the individual eye shadow. Posted in Christmas LooksTagged Benefit, Bobbi Brown, Creating eye makeup looks, False Lashes, Festive looks, MAC, MAC eye shadow, Night time eye shadow, NYE, They're real mascaraBookmark the permalink.